Don’t get me wrong, I agree with Bruno Mars (“you’re amazing just the way you are”) but maybe you just want to be a better version of yourself. We all made those resolutions about living a healthier lifestyle in the New Year so let’s make 2016 different and actually STICK WITH them. Here are some ideas for accessible and cost free activities that promote healthy living in King County Parks. Exercise your mind as well as your body by trail running. Forget the boring treadmill and give your knees a break on the trails at King County’s Cougar Mountain Regional Wildland Park. Deemed a “trail running sanctuary” by active.com, the park is a gem of the King County Parks system. Start at one of the four main trail heads and meander through the 36 miles of well-kept trails. Because the trails connect and intertwine, users of all skill levels can create a route specific to their abilities and goals. You will encounter flowing waterfalls, beautifully crafted bridges, glacial boulders, massive cedar trees and dense undergrowth. Coal Creek Falls, Wildside Trail-De Leo Wall and Red Town Meadow & Trails are just some of the popular routes and according to recent trip reports, the trails are still snow free. Cycling in King County’s Regional Trail System. Did you know that King County Parks has one of the nation’s most extensive multi-use networks with more than 175 miles of bike trails? Cycling is one of the best forms of exercise as it builds stamina, eats up calories, tones muscles, improves coordination, reduces stress and is a low-impact activity. Dust off your seat, oil your chain and start commuting to work or taking recreational rides this winter. Jump on the East Lake Sammamish Trail, Burke-Gilman Trail or the Green River Trail to tone your calves as well as your mind. 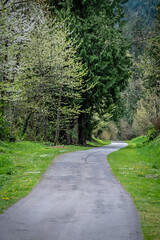 Explore the King County Parks Regional Trail System online for trails in your area.